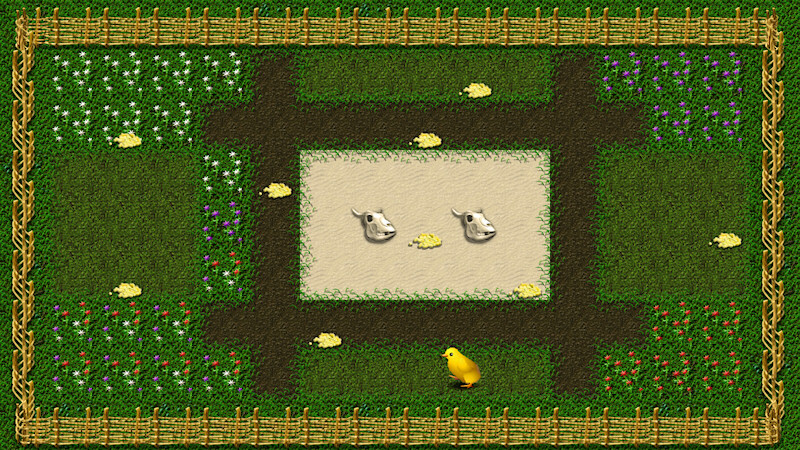 "Pick the Corn" is a puzzle game for all ages from six years. The player takes on the role of a chick that seeks freedom. Therefore it has to pick all of the grains in each level. The player can only move in one direction until the chick hits an obstacle. 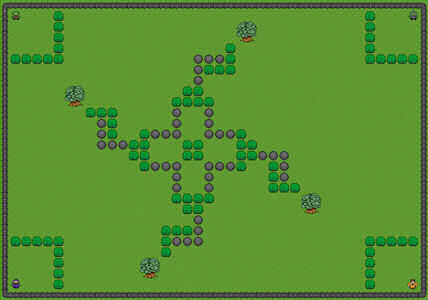 Objects such as arrows and pipes change his direction. Teleport move him to another location. Despite these hurdles, it is important to find the right way. An editor allows you to create your own puzzles. Download the demo version (only 10,7 MB!) and test the game. 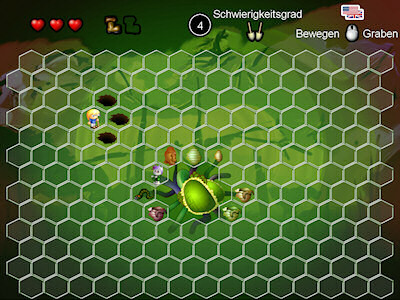 "Poisoned Heart in Swampland" is an exciting turn-based strategy game. The game contains no violence. It is a nonviolent video game. Therefore It is also suitable for children of all ages. You play a boy who wants to heal the "heart of the swamp". The heart was poisoned and now monsters make the swamp to a dangerous place. 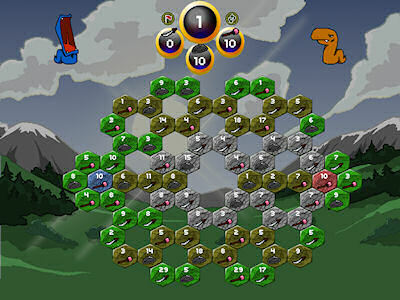 The player has, depending on the level of difficulty, several action points per round. Per point, he can go a step or dig a pit for the monsters. If they fall into the pit, they disappear and their soul goes back to the heart. When the player reaches the heart, it will be healed and the game is won. 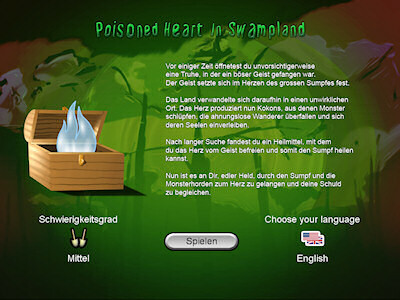 The game has a voice output in english and german and was created during the Global Game Jam 2013. Download the free and early global game jam version (only 6,8 MB!) and test the game. To achieve glory and fame you'll have to conquer the land of snake scales with your favorite weapon type: The sword of faith, the shield of doom and the snake staff of magic rainbows. But be aware! Theres Room for a second Player - And you'll mostly meet him in a furious battle, while the landscapes vanish into the ether. 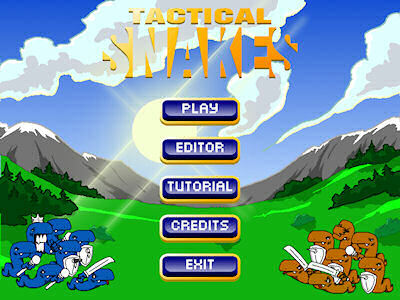 Tactical Snakes is a two player turn-based strategy game. It has a lovely tutorial and a level editor! Download and have fun! 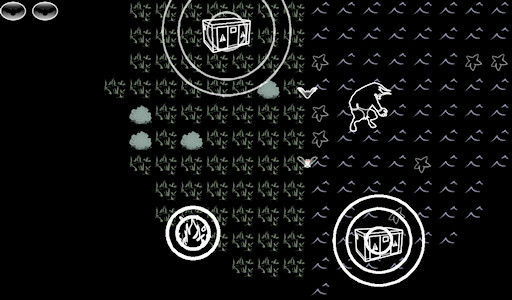 The game was created during the Global Game Jam 2012. 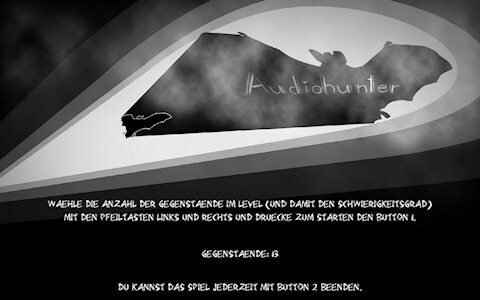 In the game Audio Hunter, you play a bat. You see nothing. But you can feel the world with your waves. But appearances are deceiving! The images that appear when you scanning the world does not match with what you hear. Only one object in the level ist consistent in your audio and visual impression. The goal is now to find this object. If you find them you can see a part of the world. Then you must find the next object until you have assigned all objects correctly. But you should not waste too much time, because in the level there is a shadow figure of the bat that chases the player. So you have to flee before this ghost constantly during your search. An exciting, fast-paced game in an unused, new scenario that invites you to explore and listening. The game was created during the Global Game Jam 2014. Y.A.C.O.B. stands for Yet Another Clone of Bomberman. 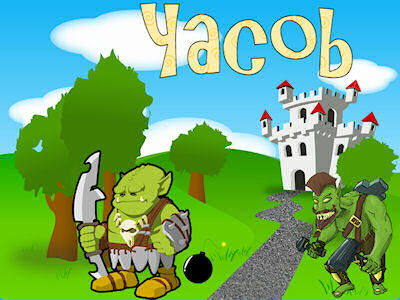 It's a funny game with orcs, bombs and whatever else makes fun! Play with up to 4 Players. With Joystick / Joypad (controller) or keyboard. Use the leveleditor and create your own levels for the game.